Israeli Prime Minister Benjamin Netanyahu said Monday he would cut short his U.S. visit and return home after a rocket fired from the Gaza Strip hit Tel Aviv wounding five people. According to political analyst Adnan Abu Amer, the evacuation of Hamas headquarters is a routine step every time a rocket is being fired from the Gaza Strip at Israel. According to Israeli intelligence sources, the only groups in Gaza that have rockets with this kind of range are Hamas and Islamic Jihad. The Hamas-run Gaza health ministry said two Palestinians, an 18-year-old and a 29-year-old, were killed by live fire, and 55 were wounded. Air-raid sirens sounded shortly before an explosion was heard in the area. 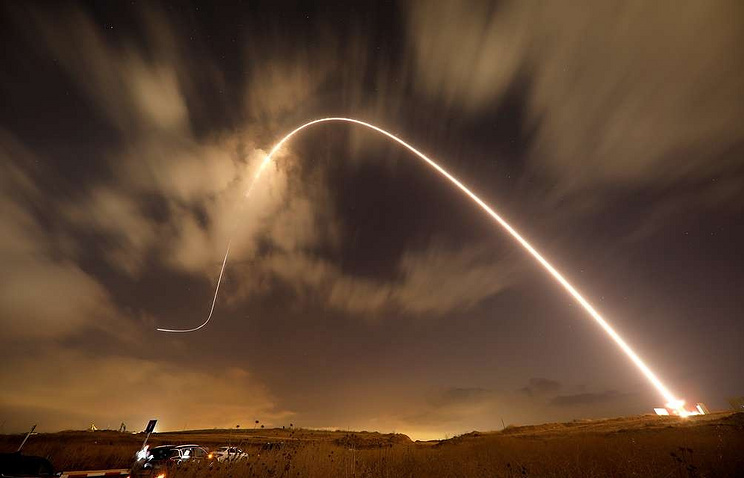 The IDF accused Hamas of carrying out Monday's pre-dawn rocket strike, and said troop reinforcements - including reservist soldiers - were being deployed to the Gaza border. The family dog was killed in the explosion. Yahya Sinwar, the head of the Islamist militant group Hamas in the coastal enclave, canceled a planned public meeting scheduled for Monday afternoon, with Hamas officials citing "developments". Israeli Prime Minister Benjamin Netanyahu, who is cutting short a trip to the United States over the incident, has vowed to respond with force. The latest attack follows disturbances involving Palestinian prisoners in southern Israel. Palestinians wave Palestinian flags as they try to climb the security fence on the border between Israel and the Gaza Strip, east of Gaza City, on March 22, 2019. Trump tweeted that Israel should have full sovereignty over the long-disputed Golan Heights, which Israel seized from Syria during the 1967 Six-Day War. The incident began when several Hamas prisoners stabbed two prison guards, moderately wounding one of them.